In this edition of Popular Mechanic, we meet Clyde DuMach of DuMach's Custom Auto Repair in Addleboro, Tennessee. 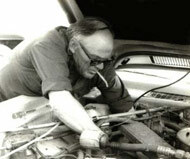 Clyde is today the chief repair guy in the family business his grandfather began back in 1951. With each generation, the oil and grime seems to have enhanced their appeal and led to very rewarding, if not often intriguing careers. "We had to build an addition to the office back in '98 because of the secondary demand." Clyde explained as we toured the facility. And it is that addition he mentioned that makes this grease pit different from many others. "In there is a small sofa, a queen-sized bed and a restroom equipped with Jacuzzi and walk-in shower." Just as we were about to inquire about this unusual section of the business, a very late model SUV drove up and from it stepped a young woman who walked right up to Clyde and gave him a kiss. "I need my oil changed... again." she said with a smile before then handing him the keys and disappearing behind the door. "Yup!" he said. "Just like that." Dumach went on to tell us that this is a fairly regular occurrence and that because of the obvious peril it would pose to any long-term relationship, he has never married. "Being that this is a real part of staying in business for me, I really can't turn any of them away and sexual preference has no place when it comes to making sure that the bills get paid and the fridge stays full." With that, he turned, pulled the SUV onto the rack, began draining the oil and then followed his attractive customer's path behind the special door. Clyde Dumach of DuMach's Custom Auto Repair in Addleboro, Tennessee - Popular Mechanic for March, 2014.